● Let God speak to us before we speak to him. ● Focus our attention on God and seek him. ● Express our desires with emotions. Get God’s answers to life’s tough questions! Everyone faces hard decisions in life. And when we do, there’s no simple formula for discovering God’s answers. But one thing’s for sure: you’ll never find them if you’re looking in the wrong place. 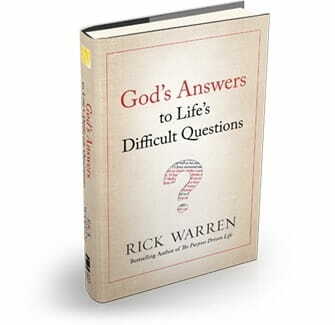 Pastor Rick Warren wants to show you how the Bible answers 12 of life’s toughest questions in his book, God’s Answers to Life’s Difficult Questions. You’ll learn the answers to questions such as . . .
• How can I cope with stress? • How can I rebound from failure? • How can I be confident in a crisis? • How can I overcome loneliness? We’ll send you God’s Answers to Life’s Difficult Questions to thank you for your donation to share Daily Hope with more people. So request your copy when you give below. Thank you for your partnership in reaching the least, the last, and the lost!